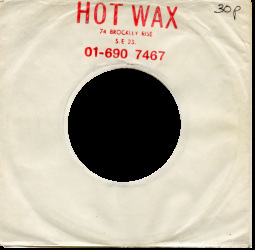 I used to visit Hot Wax during 1982 and `83 and vaguely remember Ray Wilks being behind the counter. I still have the slightly scruffy copy of the 'Reggae Special' compilation LP on UK Coxsone that I bought from there for 75p, at a time when absolutely nobody wanted old Reggae and Ska records. Comment: Mark Griffiths.